We will work with paper clay slabs. You will learn how to break a few rules and dare to move your work to the next level. Beginners are able to do more than they thought possible, and advanced students will soar. This spontaneous method encourages the happy accident...which isn't really an accident. Instead, it's your inner artist expressing itself. You’ll learn to loosen up and follow where the clay leads. I will arm you with the basics and lead you as we create a full torso piece over our two days together. Michele has spent 15 years exploring and perfecting a process she calls "Spontaneous Clay." 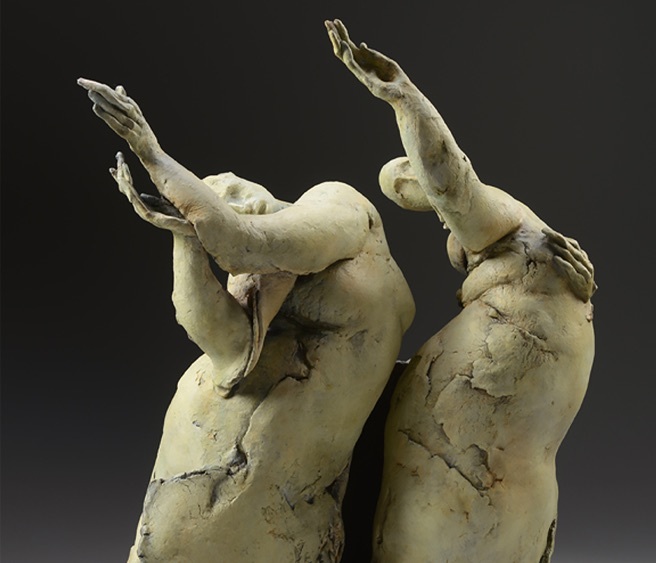 Working with paper clay slabs, she encourages the clay to fold, stretch and tear to express her vision for a sculpture. She has been teaching this method to beginners and advanced students for many years with great success. • Banding wheel or any kind of lazy susan type of base which allows you to turn your piece as you work.